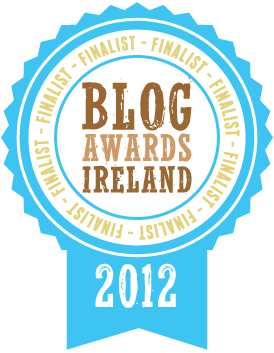 I’m a bit late with this update but I found out over the weekend that my little blog is a finalist in the 2012 Blog Awards Ireland. Bit speechless to be honest as having a sneaky glance at the other blogs who’ve been nominated alongside me in the ‘ Best Personal Blog’ category and the quality of their work is at a very high level. That goes for the finalists in the other 29 categories too. Big thanks to everyone who nominated me, all the sponsors especially Red Oak Tax Refunds who are sponsoring my category, the judges and organisers Beatrice Whelan, Amanda Webb and Lorna Sixsmith for all their hard work. A bit unsure as to whether or not I’m going to go to the Awards themselves. This year they’re being held in the Osprey Hotel in Naas so there’s the transport there and back and accommodation costs to factor in. Tickets aren’t cheap-€50 a pop which does include dinner and entertainment.Personally I’d prefer to not have to pay for a sit down dinner and would be more than happy with a few drinks and nibbly bits but I guess an awards ceremony requires a bit more glam than a basket of chips and cocktail sausages at every table. Dermot Whelan is the MC so that is kind of swaying me to the will of the Yes camp that has set up headquarters in the fun side of my brain. I’ve never been to an awards ceremony and there’s a bit of a thrill with being nominated. The No camp is busy penning slogans of “Who’s going to mind the baby?” and “Save your money now” in the boring responsible space, buried deep in the right side of my cerebrum. It’s head versus heart and at the moment, it’s too close to call which side will win out.